VATICAN CITY (CNS) — The challenges and experiences of the church in Latin America figure heavily in Pope Francis’ papacy, especially when it comes to making bishop appointments, addressing global issues and the pastoral care of the poor and the marginalized. Pope Francis’ preference for “shepherds with the smell of sheep” has become a prerequisite in his recent appointments. In July, the pope chose a relatively unknown pastor from a small diocese in the Dominican Republic to lead the metropolitan archdiocese of Santo Domingo, where the evangelization of the New World began. Bishop Francisco Ozoria Acosta of San Pedro de Macoris, who has experience as a pastor, vice rector, director of formation and professor in pastoral theology, was considered by many as a surprise choice. However, choosing a bishop whose ecclesial ministry is centered on pastoral care offers a glimpse into the pope’s vision of a church that looks outward rather than being self-referential, a vision he embraced as a Jesuit priest, as the archbishop of a major Latin American archdiocese and now as pope. “This doesn’t mean that Pope Francis presents the Latin American church as a model and repeats what he did (there). Rather, he takes from his ecclesial experience in Latin America all that he believes is important for his universal pastoral ministry,” Guzman Carriquiry, secretary of the Pontifical Commission for Latin America told Catholic News Service in early June. “It seems to me very clear that in the conclaves, popes are chosen not because of geopolitical calculations, nor due to a majority from a (particular) region. The person chosen is that unique person who gathers the qualities that the cardinals — together in conclave and inspired by the Holy Spirit — consider to be the one most suitable to guide the church in a given historical moment,” Carriquiry said. While the world is currently witnessing the effects of a more globalized society, the pope has seen it firsthand in his homeland. In a letter commemorating the 200th anniversary of Argentina’s independence, Pope Francis highlighted the suffering of the sick, the poor, prisoners, as well as those exploited through child abuse, drugs and human trafficking. “They are the most afflicted children of the motherland,” he wrote. The importance of reaching out to the peripheries is a constant theme emphasized by Pope Francis. However, his calling for a church that reaches out to those in the margins of society was made long before his election. As archbishop of Buenos Aires, Argentina, he headed the drafting committee for the final document of the Fifth General Conference of the Bishops of Latin America and the Caribbean in 2007 in Aparecida, Brazil. Its call to renew the church’s commitment to mission and discipleship in the Latin American continent, particularly to those far from the church, continues to resonate today, particularly in a time where the church is in decline in traditionally Catholic countries. “It is not by chance that he became pope in the emerging moment of the peripheries within the dynamics of Catholicism,” Carriquiry said. The countries with the largest population of Catholics — Mexico, Brazil, the United States and the Philippines — “are all peripheries within Catholicism,” he added. “The countries following those are France, Italy and Poland. But within 10 years, these three countries will be surpassed in numbers of Catholics. By whom? Nigeria, Colombia and Congo,” he noted. The plight of migrants and refugees is another issue close to the pope’s heart, a view “that has shaped his personality” through his own personal experience as “the son of immigrants who were the forebears of a great Catholic tradition,” Carriquiry said. One of the pope’s surprising gestures was bringing three Syrian families back to Italy with him following a visit to a refugee camp in Greece April 16. On his return flight, the pope emphasized the need to integrate rather than reject those who come in search of a better life. “With integration, Europe’s culture is enriched. I think that we need an education, a lesson, on a culture of integration,” the pope told journalists April 16. 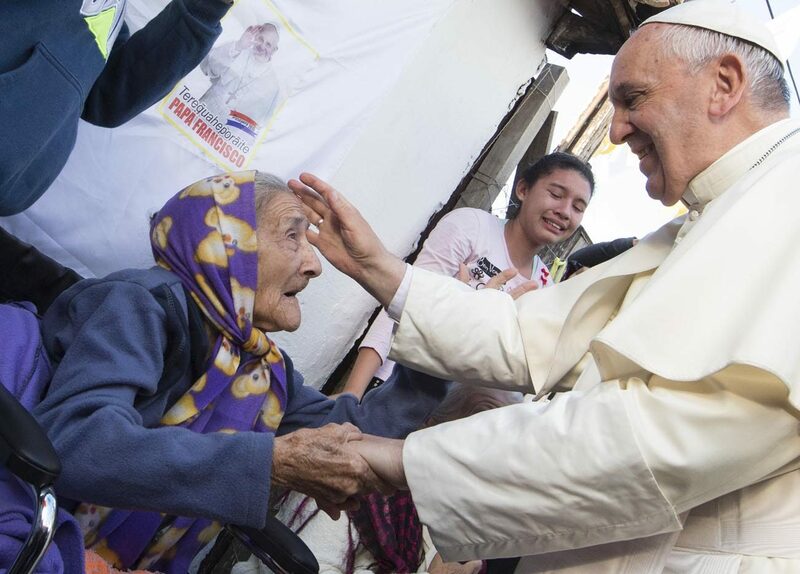 Nevertheless, Pope Francis’ emphasis on the church’s preferential love for the poor and the suffering, while certainly influenced by his Latin American roots, is not a foreign concept, Carriquiry told CNS. “These are not Latin American inventions; these are fundamental themes for the life and mission of the church. What can certainly be attributed to Latin America is the Aparecida document, which launched the continental mission, that missionary impulse urged by the pope,” Carriquiry said.